Last month I presented an overview of the moons of the Outer Planets, one of which is Iapetus - a small 1500 km diameter moon made of ice. It's a very strange looking beast on account of a ridge, nicknamed the "Belly Band". 20 km across and 13 km high, it wraps pretty well all the way around the moon's equator. This makes the moon resemble a Walnut. During that presentation I said I had no idea how such a feature might form. What I didn't know was that Sky & Telescope had just published a short news announcement that claimed to explain the Belly Band. The Sky & Telescope announcement outlined a new hypothesis according to which Iapetus spun so fast in its early history that its equator developed a bulge. As the ice moon cooled with time, it shrank - and as it shrank the bulge was squeezed and turned into the Belly Band. A number of RASCALS asked me about this hypothesis after my presentation. So, how does it stand up to scrutiny ? ​Here's a perfectly spherical moon seen in 2D. If it spins fast enough on its axis it will flatten at the poles and bulge at the equator. Notice how the bulge is not a localised deviation from a spherical shape. Rather, it has a very broad base - or more technically a long wavelength. According to the shrinkage hypothesis, we now cool the moon and the bulge will turn into a highly localised ridge. How does this work ? Now, it's quite true that if you take a localised bump - like the one drawn in red - and squeeze it perfectly homogeneously ... you can turn it into a much sharper bump that would look like the Belly Band on Iapetus (see left image). 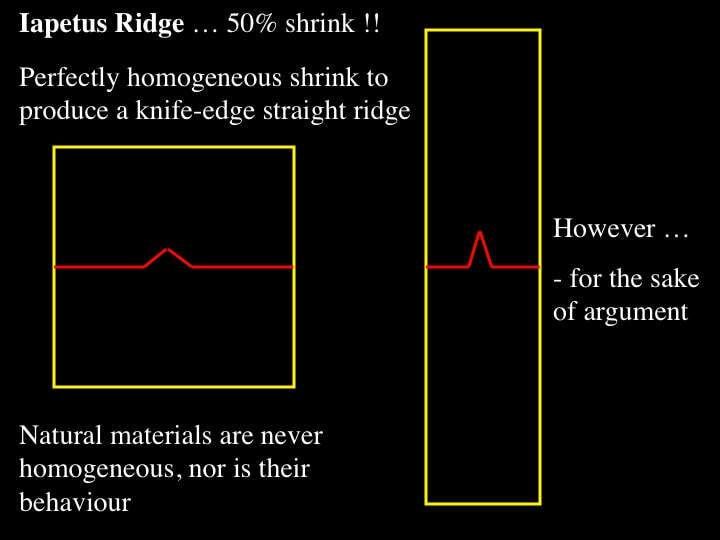 For this demonstration I'm going to impose a ridiculously high horizontal shortening of 50% so that you can see the effect, but I have to tell you that thermal shrinkage would result in something more like 2% shortening. In addition, real rocks and real ice are never homogeneous, so they will break in places instead of behaving uniformly everywhere. Nonetheless - here's the result of 50% homogeneous shortening, and yes, it looks like a localised ridge. 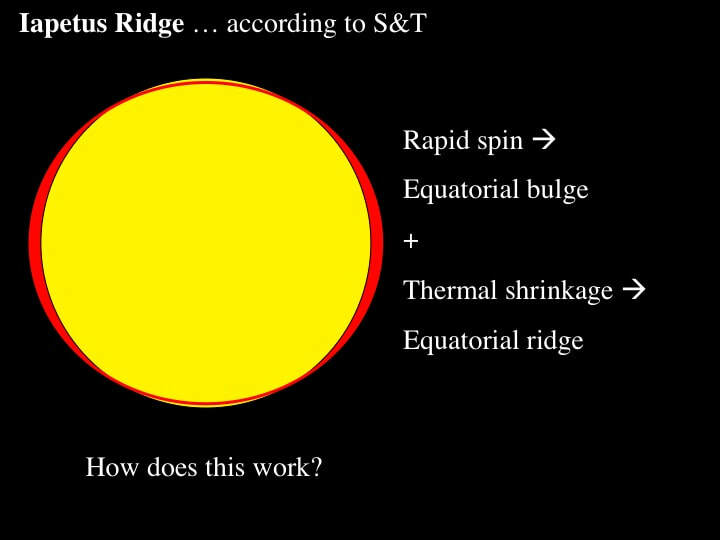 But the S&T announcement says that we start with an equatorial bulge, which would look like the right image. If we squeeze this by 50% we get something that looks nothing like the Belly Band, which I've redrawn on the far right fro comparison. Also, remember that we are squeezing a ridiculous 50% to generate this much of a shape change. 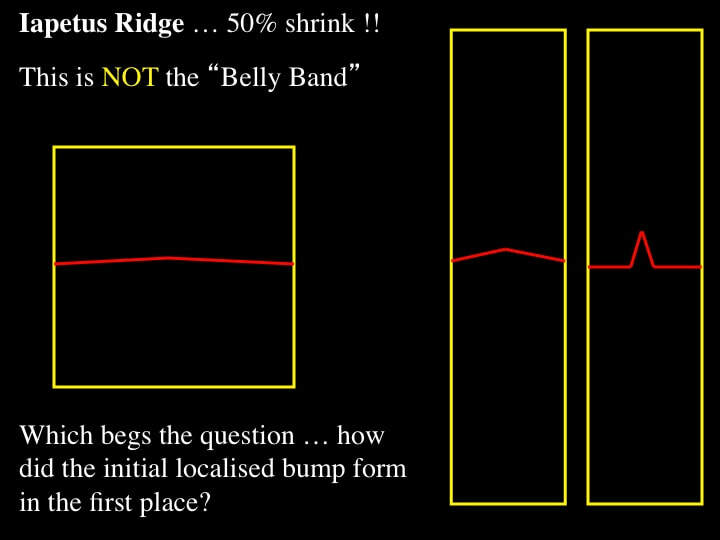 In short, we need a highly localised bump to produce any kind of ridge - even at 50% shortening - and that brings us back to the original question : where does the original localised bump come from in the first place ? I simply don't know ... and nor does anyone else ! On top of all this, we already know that Mercury's surface contracted when its disproportionately large core shrank as it cooled. Mercury's surface did not respond uniformly to this shrinkage - it broke in many places to form giant shrinkage cracks. Mercury would never have formed a Belly Band ! However, there are other hypotheses. For example the idea that Iapetus had a ring system like Saturn, that collapsed - perfectly - onto the moon's surface to form the Belly Belt (that's in an older S&T). Try this calculation : if the rings of Saturn were solid, they would form a volume 100,000 cubic kilometres. However, the volume of the Belly Band is significantly more than 1 million cubic kilometres - an order of magnitude greater ! If the rings of Saturn can't account for the volume of Iapetus' equatorial ridge, I would suggest that rings around the moon couldn't do the job either. 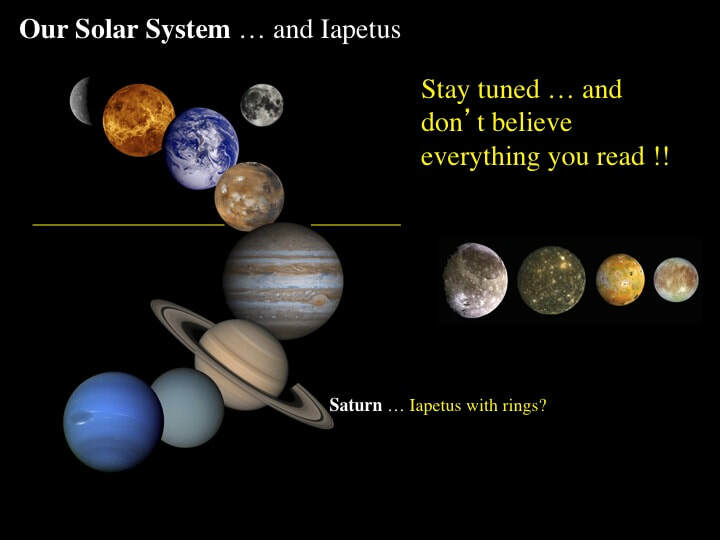 So, my take-home message here is pretty straight forward : Iapetus remains an enigma, and don't believe everything you read in S&T.